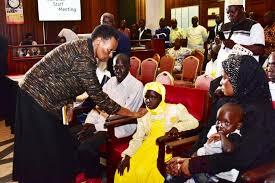 Ms Janet Museveni consoles MP Abiriga’s family at Parliament on Sunday. The assassination of Ibrahim Abiriga, MP (Arua Municipality) has left First Lady, Janet Kataha Museveni wondering whether it is now a crime to serve Uganda with passion. Janet, who doubles as Minister of Education made the remarks this afternoon at Parliament where she had joined the rest of MPs to pay tribute to the fallen retired colonel. She said that whereas many have professed to loving Abiriga, there is still a group that had the capacity to hate Abiriga so much to the extent of mercilessly murdering him in cold blood, warning that the direction the killers had taken was regrettable. The Minister of Education said that whereas some people knew Abiriga as a harmless man who only loved his party, there are those that knew him in yellow, his desires to serve his country and the party with dedication, these same qualities might have inspired them to kill him in cold blood. “While Abiriga spread love and understanding, there are many of us who spread hatred and poisonous stories that truly poison large sections of the society. In time, that poison goes and spills over as lava from a volcano and it runs through communities, destroying everything in its way,” Janet said. The Minister accused Abiriga’s killers of trying to take back Uganda to the chaotic scenes that marred the nation in the 60’s to 80’s before her husband President Museveni grabbed power. Janet said that while it may be easy and it is okay for Ugandans to blame Government, because Government has the responsibility to protect people and blame Government for what it may and might not have done, the same people blaming Government shouldn’t forget the fact they have a responsibility of building this country.